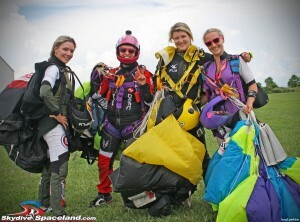 Charity Kelly, Alexandra Neale, Cara Considine, and Tammie Frank set a world record vertical head-up large-formation record on Aug. 10, 2014. Rosharon, Texas (Aug. 11)—On Aug. 10, 2014, four female skydivers set a new world record for largest vertical skydiving formation performed in a head-up orientation (also known as sit-flying or feet-first flying) at Skydive Spaceland-Houston in Rosharon, Texas, just south of Houston. The women achieved the record on their eleventh attempt during the annual Jump for the Rose fundraiser, which benefits The Rose, a Houston-area nonprofit breast health organization. Head-up group skydiving records are relatively new on the world scene, and the Texas girls are the first to claim a world record in this category. 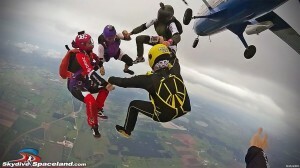 This type of skydiving is high-speed and challenging even for very experienced jumpers. The four women who set the record—Cara Considine and Charity Kelly of the Dallas area with Tammie Frank and Alexandra Neale of Houston—were part of a group of 12 women working together to achieve the world record. Brad Perkins flew with the ladies to record the record performance. Three qualified judges have certified the performance, which is awaiting final ratification by the international governing body of aeronautics. “Not only did I see some of the best all female feet first flying ever, I saw some of the best feet first flying, period,” said Ben Nelson, one of the group’s videographers and mentors. The Jump for the Rose event was a great success in fundraising as well as record-setting. “We had our best year ever!” said Jump for the Rose founder Marian Sparks. “It was an honor to have some of the most talented lady skydivers attend and get the world record at our event! We raised more money than ever due to the generous support of our friends and sponsors. Donations are still coming in, and we expect to be able to donate more money to The Rose than we gave last year, which was $17,000. “We are grateful for the awesome weather we had and to Skydive Spaceland for providing such a great facility to hold our event,” she added. NOTE: Several earlier attempts resulted in formations the same size as the claimed record, but as the girls declared a larger formation attempt on those jumps and were unsuccessful at that, those attempts were not certifiable as records. This is to clarify why the “additional” photos/video linked above show formations as big as that in the record photo linked first, but are not considered records. Jump for the Rose (JFTR) is a grassroots 501(c)3 corporation. As a men’s and women’s skydiving organization, JFTR is dedicated to raising funds for The Rose, a Houston-area breast cancer clinic. The clinic’s mission is to reduce deaths from breast cancer by providing screening, diagnostics and access to treatment for all women regardless of their ability to pay. Their services covered screening and successful breast cancer treatments for Jump for the Rose’s founder, Marian Sparks. Skydive Spaceland is a three-generation family-owned and -operated skydiving business located in Rosharon, Texas, just south of Houston, Texas. First opened for business in February 2000 by Steve Boyd, Sr., Skydive Spaceland has grown into a truly world-class skydiving facility open 7 days a week and capable of handling hundreds of skydivers jumping daily. More than 100,000 skydiving students have been instructed at Spaceland and the center facilitates about 70,000 skydives per year. Skydive Spaceland has also played host to the world’s largest skydiving competition, the United Parachuting Association National Skydiving Championships (2009) , as well as several other large competitions including the U.S. National Collegiate Parachuting Championships and multiple U.S. National Canopy Piloting Championships. Several state, national, and world records have also been set at Spaceland including the Texas State Record 150-person skydive in 2007, 168-person skydive in 2011, and multiple Women’s Texas State Record skydives held jointly as fundraisers for Jump for the Rose.